The giant metal sculpture looks like a pair of spaceships, gleaming metal modules perched on lander legs that resemble habitats used to simulate Mars missions. The umbilical cord snaking away from the sculpture gives it an unexpectedly organic feel, and hints at what lies within — algae and a "digital life-form" that draws energy and data from the green-energy power plant the sculpture stands in front of in Belgium. This artwork and others like it are the brainchildren of artist and scientist Angelo Vermeulen. His journey has not only led him to creative projects worldwide, but to also participate in the upcoming HI-SEAS Mars mission simulation, where crew members will live and work as astronauts inside a faux space habitat in Hawaii for four months. By weaving together biology and technology, Vermeulen's artistic and scientific explorations could help rethink how people interact with the systems that can keep them in both space and on Earth. Vermeulen was fascinated by art and science since high school, when he was enraptured by night photography but also owned a lab with a microscope and chemicals with which he analyzed samples he collected on nature walks. He earned his PhD researching ecology, environmental pollution and teratology at the University of Leuven in Belgium in 1998, and in the same year earned a degree in photography. "I moved out of a professional science career mainly because I felt too confined," Vermeulen said. "Doing a PhD in science is a very specializing job, and I was specialized on mouthpart deformities of larvae of nonbiting midges, which can shed light on environmental pollution. I couldn't imagine building a world for myself on such a tiny specific segment of the whole world — I wanted to explore more." When Vermeulen first pursued art professionally, he distanced himself from science, but over time began to incorporating his passion for biology into his art. "Your creativity becomes so much more powerful when you embrace all the skills and talents you have," he said. 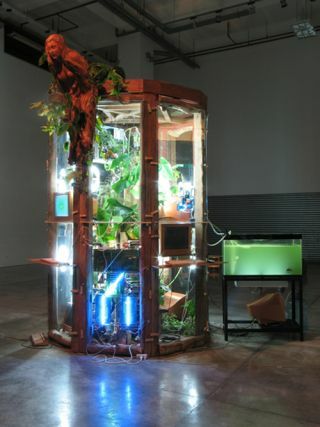 For example, Vermeulen incorporated water fleas and fish in a compact aquatic community at the core of his art installation piece Blue Shift [LOG. 1], a collaboration with evolutionary biologist Luc De Meester at the University of Leuven and engineers from electronics company Philips in 2005. The water fleas are attracted to yellow light and repelled by blue. When visitors approach the installation and pass a sensor, yellow lights on top of the aquaria turn off and blue lights turn on, driving the water fleas downward through small holes in the bottom of the aquaria to fish that immediately fed on most of them. In this manner, the installation explored evolution — would water fleas that were less repelled by blue light have a better chance of surviving and reproducing, pushing their legacy to dominate the aquaria? This art began Vermeulen's move toward space by attracting the attention of microbiologist Max Mergeay in 2008, one of the founding fathers of the bioregenerative life support system MELiSSA (Micro-Ecological Life Support System Alternative). That project from the European Space Agency (ESA) aims to develop an artificial ecosystem for the complete recycling of gas, liquid and solid wastes to produce oxygen, water and food during long-distance space exploration missions. A "bioreactor" from MELiSSA holding a bacterial culture of Rhodospirillum rubrum actually formed the heart of Vermeulen's 2011 project BODYREACTOR. There, he and sociologist Tine Holvoet invited theatre and performance students to explore the idea of humans in outer space by setting up a dedicated workshop space. The bacterial culture was installed inside a participatory sculpture that resembled a lunar lander. "For them, we wanted to shed light on the nature of what it means to be human," Vermeulen said. "We provided living organisms typically used in space-based experiments to introduce the students to hands-on biology, for a broader perspective on space exploration that they might use with their performances. When you entered the installation, there was very much a feeling on building a future for humanity in outer space, a post-planetary consciousness." In the biological sculpture known as the Merapi Terraforming Project, Vermeulen took a very different take on biology and space in Indonesia in 2011. Mount Merapi is the most active volcano in Indonesia, with the most recent large eruption taking place in 2010. Normally, biology is very slow to grow back in the volcanic soil due to a virtually complete absence of the fertilizing nutrient nitrogen. The Merapi Terraforming Project used nitrogen-fixing bacteria to help grow legumes in a structure on the flanks of the volcano as both an experiment in food production and a monument to the traumatic past of the location. "The project was inspired by the science-fiction notion of terraforming, which is a touchy subject in the astrobiology community, since it's pretty much the opposite of the notion of investigating precious life in other places — you're basically rejecting a location's nature to change it to what you know," Vermeulen said. "I'm not a proponent of terraforming, but it's interesting in that it keeps the discussion going on human spaceflight and space settlement. Terraforming is also a mirror on human society, in that it's essentially an extreme form of colonization, and so this can reflect on errors made in the past with colonialism, errors we might make again." All this space-related work led Vermeulen to begin a second PhD at Delft University of Technology in 2011. He is now researching the idea of future habitation in space with artificial ecosystems. "I'm aiming to really connect how ecological, technological and social systems interact in habitats, create a hybrid of these three," he said. "All of these systems have to cohabit and work together for the habitat as a whole to work. This is interesting from an artistic and ethical point of view, and from the point of view of humanity — I want people to feel empowered, to build resilient systems that can respond and cope with changes." The idea of interactivity is often found in Vermeulen's work, not only between artist and viewer, but also between different kinds of systems, such as biology and electronics, "which draws on a long interest in science fiction," Vermeulen said. "Life and machines are often seen as opponents, but I'm interested in how they can work together, and work with people." Biological and technological hybrids inform Vermeulen's longest-running work, a "living, pulsating cybersculpture" known as Biomodd. The project has undergone multiple incarnations since 2007 in Ohio, the Philippines, the Netherlands, Belgium, Slovenia and New Zealand, changing itself depending on the local collaborators and culture, but in all cases fuses recycled computer systems with living ecosystems. The latest version of Biomodd will debut in New York in October at the New York Hall of Science as part of the center's first contemporary art exhibit. "In this latest rendition of Biomodd, we're growing edible plants," Vermeulen said. "There's a lot of discussion of urban farming going on in New York City, and the area where the New York Hall of Science is in Queens is home to mostly immigrants, mostly from Latin America but also from Asia. One way to connect with a diverse community like that is with food, the universal communicator, and we hope people will use it to grow foods from their original region." The New York Hall of Science's main exhibition hall "is basically nuclear fallout shelter architecture from the 1960s, which was a challenge, since that meant there wouldn't be daylight to grow Biomodd," Vermeulen said. "But we embraced that challenge, and it ended up being like a situation you would have in space where you have to deal with limited resources in an environment that's not immediately conducive for life to grow, and you're in a shelter that protects you from radiation." Coincidentally, the New York Hall of Science is home to Gemini-Titan 2 and Mercury-Atlas rockets and capsules. "There's just this spaceship metaphor that happened with this work that was beautiful. It's amazing what can happen if you're a bit creative with serendipity."